A great fence is only as good as its gate. Over time, though, the gate to your fence may begin to stop functioning as flawlessly as it once did. If you find that your gate is sticking and has become a hassle to open and close, here are the things you can do to fix it. Any time your gate becomes misaligned it may begin to stick. When troubleshooting what is causing this misalignment, though, there are several factors at play. 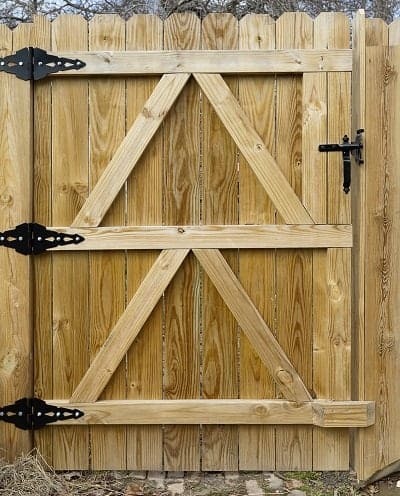 Wobbly posts and loose hinges can cause a gate to sag. Sometimes, the gate itself may become warped. Wooden gates will often retain moisture, and when the moisture evaporates the gate sags and may start to stick. For metal gates, sticking most often occurs if the pins connecting the gate to the post have been bent or if the posts themselves are wobbly. As mentioned, when a wooden gate retains the moisture it can become warped. At this point, fixing it can be much more troublesome, and it’s best to avoid the issue altogether by applying varnish to your fence and gate. The first thing you will want to do is check your hinges to see if they are loose or wobbly. Since hinges are easily replaced, discovering that they are the reason your gate is sticking often amounts to a quick and simple fix. Over time, posts may begin to wobble. If you find that a wobbly, unsecured post is the reason your gate is sticking, correct the issue by driving stakes down into the ground at the base of the post and connecting the post to the stakes with a bolt. If neither your hinges nor your posts are wobbly, you will want to check and see if the frame of your gate is square. If it is bent at all, you can straighten it by using a turnbuckle kit. If you decide the best way to keep your gate from sticking is to replace it with a new one, we would be happy to help you choose and install a high-quality, attractive gate that is built to last. To learn more about the gate options we have available as well as all of the fencing solutions we offer, please feel free to contact us today.